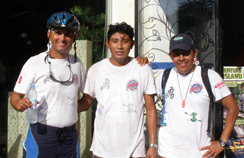 In the mood for adventure and fitness, we contacted Adventours for a day of biking, kayaking, and snorkeling, or what we later playfully referred to as our "triathlon" day in Ixtapa-Zihuatanejo, Mexico. The Adventure Kids are always looking for our next adventure, and since we enjoy biking, (or at least Edward does, Debra merely goes along for the ride), as well as kayaking and snorkeling, when we were in Ixtapa-Zihuatanejo in December 2007 and learned about Adventours' Adventure on the Island program which combines all three activities, we decided to experience it. Pablo Mendizábal Reyes, owner of Adventours, equipped us with bicycles and helmets, provided us with an overview of the program, which would begin with a 4.5-mile (7 km) bike ride, and after a practice spin, we positioned our bikes behind Pablo's and his team of Humberto and Javier, and were off on our adventure along with other riders in our group. If you cycle regularly, (which Edward does), riding 4.5-miles is a lark, however, when you avoid riding a bicycle at all costs (Debra), 4.5-miles (7 km) may as well be 45-miles (72 km), especially when the temperatures are in the high 70s to mid-80s and there are hills involved! Riding on the bike path did have its advantages though, one it kept us out of the path of car traffic, and two, (for Debra) the distance in km is clearly marked on the path, which (Debra) looked at with encouragement as we passed each half km mark cheering to herself (and sometimes out loud when a hill was involved) counting down each successive km towards our goal. Everything was going well until half way through our ride another rider came up alongside (Debra) and asked her a question causing (Debra) to be distracted and steer off the path, fall to the pavement, scrape her knee, and tear her pants. However, not to be deterred from finishing the ride, got back on the bike, with the alignment now severely altered, and with solid determination rode to our first rest stop where Pablo, a biologist, told us about the rich biodiversity of Mexico, which is the fourth largest in the world, and has 320 different species of birds. He also told us about the mangroves which are federally protected because of their strong nursery for juvenile fish and birds. After watching the birds and having a drink of water, we rode our bikes to Playa Linda, and dismounting, we felt an immediate sense of accomplishment; we had ridden 4.5-miles and we were still standing; this was indeed a very good start. We caught a water taxi to Ixtapa Island and were delighted with the vista that awaited us, thatched umbrellas and lounge chairs, a white sandy stretch of beach, and a rugged rock outcropping. For the next few hours, we would be cavorting here and soaking up the sun, however, before we could relax in the shade of the beach umbrellas it was time for a kayak tour. Although we kayak regularly, we use solo kayaks and these kayaks were tandem, which we thought should prove rather interesting, as it requires synchronized paddle movements. After a small debate over who would sit where, we decided that (Debra) would sit in front. 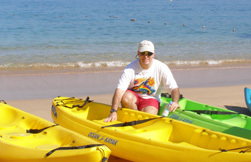 Following Javier, we adjusted our paddling and fell into an easy rhythm as we explored the island. Coming around a large promontory we glanced up and were in awe of the rugged beauty as the waves crashed on the rocks. We turned our kayaks around and headed back to the beach, and learned we had just kayaked for 40-minutes, which seemed unbelievable after haven ridden bikes for 4.5-miles. As the saying goes, no rest for the weary, and with barely a blink of the eye, and a quick glance at the restaurant menu just long enough to place our order for lunch, we were fitted for snorkeling gear of mask, snorkel, and fins, and then headed to the other side of Ixtapa Island where the sheltered coral reef is teeming with sea life. 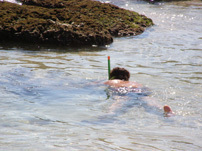 Glancing down as we entered the water we could see tiny fish swimming a few feet from shore, and from then on, the snorkeling was wonderful with sightings of Sea Cucumbers, Puffer Fish, Tangs, Zebra Moray, Convicts, Sergeant Majors, Butterfly Fish, and many more. An hour passed and we emerged from the water with prune-like fingers and enormous appetites. Fortunately, by the time we finished snorkeling, and were approaching our table, the waitress was just bringing out of orders of fresh shrimp and calamari cocktails paired appropriately with margaritas. Fortified by sustenance, we were now ready to relax on one of the inviting lounge chairs in the shade, however we learned that this was not to be, as it was now time to take the water taxi back to Playa Linda. 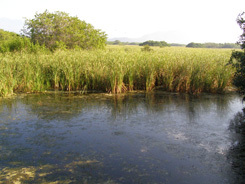 We arrived in Playa Linda and this time visited the Crocodile Pit where we watched the Crocodiles, Green Iguanas, and Turtles, as well as Ring Kingfisher, Herons, Egrets, Roseat Spoonbill, and Snakebird coexisting in the mangrove estuary. Back on our bikes, (albeit a bit reluctantly in Debra's case), it was time to complete the last leg of our adventure, riding the 4.5-miles back to the Adventours shop. Once again, (Debra) ticked off each km mark we passed as we slowly made our return, and when we finally saw the shop entrance felt a total sense of accomplishment and achievement. We had biked for 9-miles (14.5 km), kayaked for 40-minutes, and snorkeled for 1-hour, and we not only had survived our "triathlon" we actually had a fabulous and very educational time during our 6-hour Adventure on the Island! 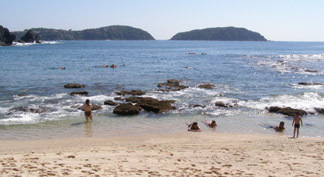 For information on Ixtapa-Zihuatanejo, Mexico, please visit the website: www.Visit-Itapa-Zihuatanejo.org.